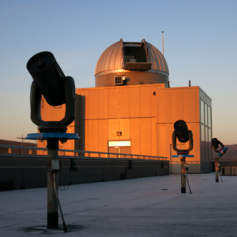 The Physics Department at Middlebury College will again host an Open House night at the College Observatory this autumn. The Observatory, located atop McCardell Bicentennial Hall, will be open to the public for viewing the heavens on Friday evening, October 9, from 8:00 PM until 9:30 PM, provided the skies are mostly clear. Visible through our telescopes will be a number of interesting stars, star clusters, and nebulae. There is no set program for the Open House night; the public is invited at any time between 8:00 PM and 9:30 PM. All Observatory public nights are free and open to the public, but will take place only if the sky is at least mostly clear. If the weather appears uncertain, visitors may call the Observatory at 443-2266 or visit the Observatory web site after 6:00 PM on the evening of the Open House for a status report. More information can also be found at go/observatory .